Art Deco Jewellery is a product of the age of the flapper, Jazz and the machine age and jewellery of the 1920’s and 30’s was in thrall to geometry: circles, arcs, squares, rectangles and triangles. Materials used ranged from rubies, gold, and pearls to plastic, chrome and steel. Platinum was the new luxury metal and was used with opaque stones like coral, jade, onyx and lapis lazuli. Art Deco costume jewelry became ever more popular and outrageous. 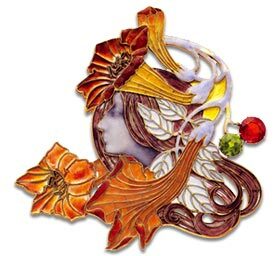 Rene Lalique, created glass jewelry in the 1920’s and 30’s. Gerard Sandoz came from a family of jewelers and began to design starkly geometric pieces for the Sandoz. His output is significant within the realms of the Art Deco period. Jean Despres, used industrial-design and the machine age aesthetic to produce jewellery that is interpreted as unwieldy and masculine, but which is suited to the Age of Jazz. Art Deco Jewellery design influences come from the age of Egyptian Pharoahs, the Orient, Tribal Africa, Cubism, Futurism, the age of machines and graphic design. Fans and collectors of Art Deco Jewellery display a love of clean lines, bold colours and sophisticated design. Is Your Art Deco Jewellery Genuine or Reproduction? But It’s often very difficult to distinguish a genuine piece of art deco jewellery from a good reproduction. However there are some key points that you should consider before you buy what you think is a genuine item of art deco jewellery. 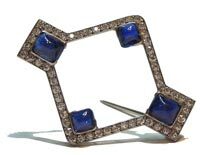 So, check that stunning art deco brooch you’ve been staring at for days on the internet. It’s obviously genuine Art Deco … or is it? Being able to identify the findings that are attached to your jewellery for function, rather than as part of the design, is sometimes a good way to determine its age, although findings can be changed or altered at a later date. Some good examples of findings, are the hinges, clasps and catches on your jewellery. The jewellery of the Victorian era, which preceded the Art deco period, featured tube hinges until a more streamlined design was introduced in the later part of the era. Other types of hinges such as roll over, C shaped and safety pin types evolved over subsequent years. A lobster catch, for instance, will certainly not be used on an item of authentic art deco jewellery. Likewise, jewellery colours and metals have changed in style over the years. The art deco period featured bright primary colours while the early Victorian era didn’t. Being able to identify the cut of your precious stone or even the type of stone in your art deco jewellery will also help in dating the piece. Modern brilliant cut diamonds, for example, were introduced to the market in the early 20th century, not before. Over the years, aluminium, platinum, pot metal and copper have featured as popular or fashionable metals. White gold for example, first introduced at the turn of the 1900s, wasn’t widely circulated until around 1920, when it was used as a low cost alternative to platinum. Similarly, 15 carat gold was a British Empire gold standard until it was discontinued in 1932. It was commonly used in late Victorian jewellery. But often in Victorian times there was more emphasis on the workmanship and beauty of the item than on the quality of materials used. Pinchbeck for example, an alloy of zinc and copper, was a respectable alternative to gold, but is commonly found at the cheaper end of today’s market, as great importance is placed on jewellery manufactured using gold or platinum. Feeling the weight of an art deco jewellery item can also help pinpoint its age. If you’re buying online, always ask the seller how much the item of art deco jewellery weighs. A brooch from the Victorian era can look a lot heavier than one reproduced in more modern times. And, quite often a large piece of art deco jewellery was made reasonably light to ensure it didn’t pull on the wearer’s clothing. Check also to see if the precious stones in your art deco jewels are glued in and if the piece is hand made or has been fashioned in a mould. A registration mark on a piece will give you an accurate time frame as will Gold, Platinum and Silver hallmarks. A jeweller makers mark or label is another great means of identification. Lastly, try to find a picture of the actual piece of Art Deco Jewellery, to compare with the piece you are considering buying. You can often find photos in antiques related books and catalogues or period references, such as Carter’s Antiques Guide. Buying Art Deco Jewellery! Remember to always carry out proper research and check every sellers credentials. 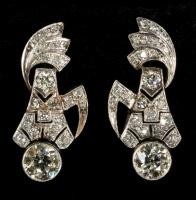 Use the internet, check out our Art Deco Jewellery section and always ask lots of questions.